If your goal is to make Chinese language and culture part of your child’s growth and life, consider us as your partner. We appreciate your goal, share your goal, and use every bit of our mind and resource to work with you to achieve that goal. We believe that children’s efforts should be sustainable and reasonable. We believe that the return for their work should be maximized by thoughtful collaborative efforts between teachers and parents. We follow our beliefs to achieve our goal through integrated efforts in our regular semester classes, summer programs in NYC and China, and ever continuing curriculum enhancement. We have brought up our first cohort of students from K and lower elementary school grades to high school grades. We are deeply involved with the following cohorts and are ready to support more. We look forward to a chance of encounter with you one way or another in the city! Founded in 2008, our program serves over 100 families from all five boroughs of New York City, New Jersey, West Chester and Long Island. Our families are diverse in their cultural and language backgrounds. We have 1st, 2nd and 3rd generation Chinese American children, Chinese-American biracial children, and children from other ethnic groups. All parents share the same goal of making Chinese language and culture part of their children’s lives. 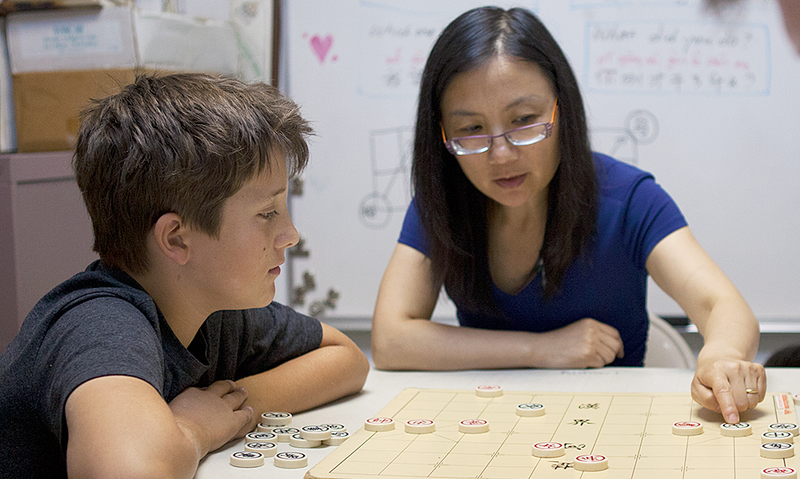 Some children come to us with previous exposure to Mandarin, Cantonese and other Chinese dialects, and other children have no previous exposure to Chinese at all. All students pursue an extensively field-tested curriculum framework, with the speed and depth tailored to their existing Chinese abilities. You can find students from all backgrounds at our most advanced levels. Students come to us once a week for a 2-hour long class during the regular school years. In the summer, many of them sustain and enrich their Chinese exposure through our NYC and China summer programs. Most of our students study for years with us, moving up our curriculum ladder in a steady fashion. We teach out of two locations: our main site in midtown Manhattan and another satellite location in Park Slope, Brooklyn. Gisela is a developmental psychologist who has been trained to understand how the mind works at different ages, specifically in processing and learning languages. Gisela received her Ph.D in Developmental and Cognitive Psychology from NYU in 1998. For over two decades, she has studied how children develop bilingual language skills, and what types of language environment are optimal for learners of different ages. Armed with a scientific framework of bilingual language development and child psychology, Gisela founded CCBG in 2008. Gisela has been directing its curriculum development and teacher training ever since. 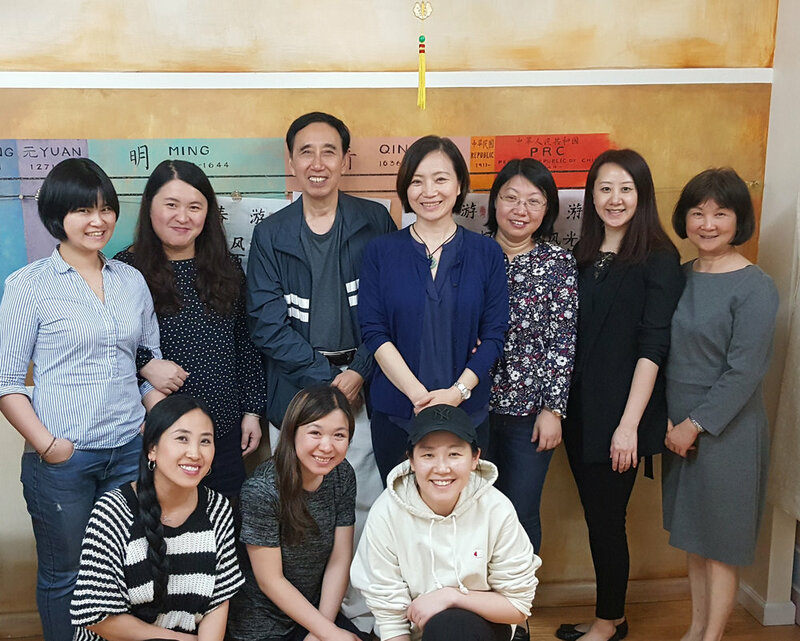 Gisela prides herself in direct and intense communication with students and parents, through teaching, meetings, and accompanying them to travel studies in China. Gisela’s combined expertise in the science of language learning and the practice of language teaching is becoming increasingly recognized. In 2016-2017, she worked on a team for NYC Board of Education to create Chinese language assessment tests for K-7 students. In the summer of 2018, she is invited by the Middlebury Language Institute to give workshops to MA students who are studying to become licensed Chinese language teachers. Gisela was born in Shanghai, grew up in Shandong Province, and went to college in Beijing. Gisela understand Shanghainese, speak her local Shandong dialect, and of course, also standard Mandarin. Our teachers consist of a core group of instructors, and a circle of experts. The instructors teach our curriculum-based classes, and the experts direct enrichment activities. All of our instructors have a strong mastery of Mandarin Chinese. They speak Mandarin free of accent, and with a rich and varied vocabulary. They are skilled in engaging children in conversations and challenge them to express themselves in Mandarin. Our teachers engage in almost daily training and dialogues to fine-tune their art of teaching. Most of our instructors have degrees in education or Chinese language and literature. Most of them have years of experiences in teaching, ranging from one to three decades. All of them plan to be career teachers and educators. Our experts consist of a growing circle of theatre, voice, calligraphy, art, and sport professionals. Except in occasional cases, they all speak Mandarin fluently. They bring to our program top expertise in their relevant fields, helping us realize our goal of “exposing children to the best”. Our instructors and experts are all keen on treating children as individuals, holding high expectations and supporting children to achieve. Our low teacher-student ratio further enhances their ability to reach these goals. Frequently described by parents as being “nurturing”, our teachers’ top goal is to maintain a safe environment where children feel free and comfortable to explore, to make mistakes and to grow. We have an ongoing recruitment of competent Chinese teachers to join our team. Work schedule is flexible and compensation depends on the nature of work. Candidates must have legal authorization to work in the United States. To apply, please email your resume to hello@ccbgnyc.com with the subject line: Teaching Position. CCBG is an equal opportunity employer.